Raven, the mobile surgical robot developed by the University of Washington, is going into the Atlantic Ocean to participate in NASA's mission to submerge a surgeon and robotic gear in a simulated spaceship. The 12th NASA Extreme Environment Mission Operations test will take place May 7 to 18 off the coast of Florida. The robot leaves Seattle on Friday. During the mission, Raven will operate in the Aquarius Undersea Laboratory, a submarine-like research pod about 60 feet underwater. This mission will test current technology for sending remote-controlled surgical robotic systems into space. During the mission, four crew members will assemble the robot and perform experiments. The two larger-than-life black robotic arms will use surgical instruments to suture a piece of rubber and move blocks from one spindle to another on what looks like a delicate children's toy. The brains behind the robot's movements will be three surgeons in front of a computer screen in Seattle: Drs. Mika Sinanan and Andrew Wright of the University of Washington's Medical Center, and Dr. Thomas Lendvay of Children's Hospital and Regional Medical Center in Seattle. Instructions will travel over a commercial Internet connection from Seattle to Key Largo, Fla., then via a special wireless connection from there to a buoy, and finally via cable underwater. Images of the simulated patient will travel back over the same network. Raven was built over the past five years in the UW's BioRobotics Lab, co-directed by professor Blake Hannaford and research associate professor Jacob Rosen in the department of electrical engineering, with partners in the UW's department of surgery. The da Vinci surgical robot, which is used at the UW and elsewhere, weighs nearly a half-ton. Raven weighs only 50 pounds. Lightweight, mobile robots could travel to wounded soldiers on the battlefield to treat combat injuries. Surgical robotic systems also could be used in disaster areas so doctors worldwide could perform emergency procedures. The robots could even travel to remote areas in the developing world so local doctors could get help on difficult procedures. NASA will test the robot's suitability for a mission to space, where it could perform emergency surgery without requiring a surgeon to be onboard. Raven went on its first road trip last summer to California's Simi Valley. Researchers installed an operating-room tent in gusting winds and temperatures nearing 100 degrees F (40 C), and hooked the equipment up to gasoline-powered generators. Surgeons completed the first field test communicating with the operating tent using an unmanned aircraft equipped with a wireless transmitter. The NASA mission poses new challenges. Researchers shrank the computers and power supplies that support the robot so they can be carried in dive bags by technical scuba divers and fit into the limited space. Most importantly, the engineers wrote an instructional manual so crew members could reassemble the robot and troubleshoot any problems they encounter. "When you build a technology as a lab prototype, it takes someone with a Ph.D. six weeks to put it together," Hannaford said. "If you build something for the field, it's got to be repairable, modular and robust." Once everything is installed in the undersea lab the crew will be alone with the robot. Crew members can communicate by phone with the ground team but they will have to operate the robot and fix any problems on their own. The four-person crew includes research collaborator and surgeon Dr. Tim Broderick of the University of Cincinnati, who will observe the robot's movements and determine its suitability for space travel. Two NASA astronauts and a NASA flight surgeon complete the crew. Also traveling to the research pod is the M7, a surgical robot developed by SRI International in Menlo Park, Calif. 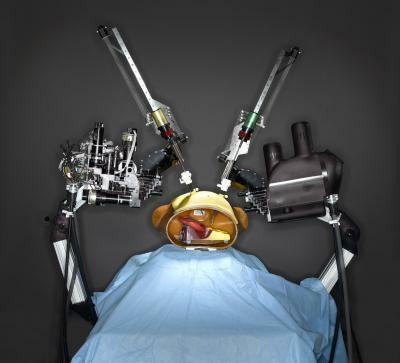 These two robots are the only existing prototypes for a mobile surgical robot, Hannaford said. Currently both robots are research projects and are not yet approved by the Food and Drug Administration for use on humans.